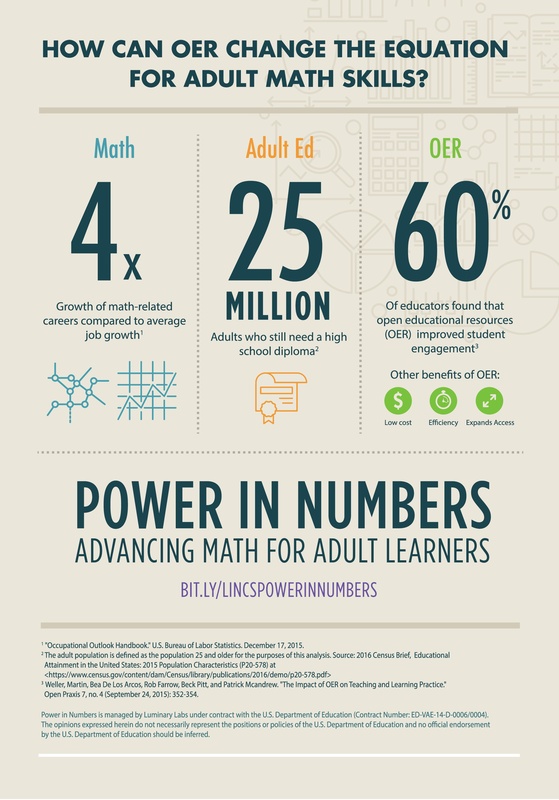 Applied math skills empower adult learners to think critically and solve challenges big and small. These skills are keys to our economic prosperity. They can open doors to further education and training, and significantly increase employment opportunities and tong-term career options. The Office of Career, Technical, and Adult Education (OCTAE) wants to help adult learners receive the applied math skills they’ll need to succeed in the real world. Power in Numbers is teaming up with teachers and other experts to curate high-quality open educational resources (OER) that adult ed instructors across the country can access for free. Join one of our teacher user groups. Read our latest research report. Learn more about the work of our Power in Numbers panel members on our Experts page.